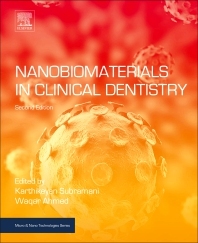 Shin-Woo Ha, Daiana Weiss, M. Neale Weitzmann and George R. Beck Jr.
Nanobiomaterials in Clinical Dentistry, Second Edition shows how a variety of nanomaterials are being used to solve problems in clinical dentistry. New nanomaterials are leading to a range of emerging dental treatments that utilize more biomimetic materials that more closely duplicate natural tooth structure (or bone, in the case of implants). The book's chapters discuss the advantages and challenges of using nanomaterials and include case studies to illustrate how a variety of materials are best used in research and practice. Post-docs, researchers and R&D in the fields of nanomaterials/biomedical nanotechnology, biochemistry, oral biology. As well as dental manufacturers, dental researchers and clinical practitioners, primarily in the areas of dental materials, restorative dentistry, implantology, oral surgery and periodontics. Waqar Ahmed is Professor of Nanoscience in the School of Mathematics and Physics, College of Science at the University of Lincoln, UK. His major research interests are in the field of nanoscience, nanotechnology and nanomedicine. At Lincoln his research is focused on nanoscience and nanotechnology for renewable energy, energy modelling and management and sustainability. He is also interested in applications of technology in teaching and learning. He has authored or coauthored over 500 publications including peer-reviewed papers, books, book chapters, reviews and expert opinions in multidisciplinary subjects.